Many interesting sculptures beautify the city of Jacksonville, Florida. 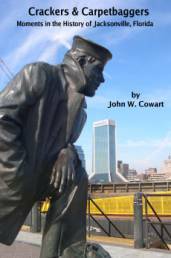 Earlier this year my son Donald took a photo of the Sailor’s Memorial Statue on the South Bank Riverwalk to use as the cover art for my book Crackers & Carpetbaggers and I became interested in the city’s other statues. In April, Ginny & I borrowed a digital camera to visit and photograph some of them.